Dickey hit so well, the shortstop became the Yankees’ regular No. 8 hitter in that season’s first half, and the man who wore No. 10 routinely batted in the 7 hole. For the record, Ruth often was switched to cleanup behind Gehrig during that season, so the whole notion of 1-8 lineup/jersey consistency was very loosely followed that first year of numbered jerseys for the Yankees. Dickey’s final season was 1946, marking his 12th All-Star selection on the way to a Hall of Fame induction. He batted seventh and started that Opening Day, again on the road against Mack’s A’s, doubling in a 5-0 win. That same season, a kid from St. Louis named Yogi Berra was called up by the Yankees (as No. 38 and 35), and 1947 marked the clean handoff of the No. 8 jersey. Berra made his first Opening Day start for the Yankees on April 15, 1947, as a right fielder, and drove in his team’s only run with a deep sac fly to center off Phil Marchildon, scoring George McQuinn in a 6-1 loss to the A’s at Yankee Stadium. Berra was a utility player in 1948, catcher-outfielder. 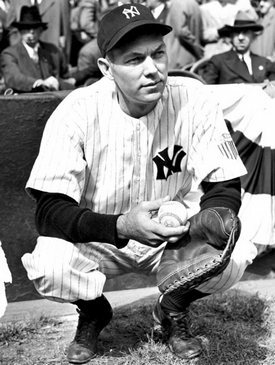 His first Opening Day start behind the plate for the Yankees came in 1950, and by then he was batting fifth behind Joe DiMaggio, reaching base four times and scoring thrice in a 15-10 opening victory at Boston. After Dickey and Berra, let’s stay on the subject of catchers and fast-forward to Opening Day 1985 at Shea Stadium. Gary Carter had just been acquired by the Mets from the Expos for four players over the winter, and this was his Mets debut. In the bottom of the 10th, 5-5 tie, right-hander Neil Allen on the mound for St. Louis, Carter lunged at slow breaking ball and was able to pull it over the wall in left-center, stirring a celebration — and helping to launch a hot rivalry at the time. Can’t believe I forgot to include Yaz in my original entry here, especially since I had the exclusive interview with him in the Red Sox player parking lot right after his ceremonial first pitch and before Game 1 of the last World Series at Fenway Park! So with apologies to Red Sox fans let’s insert another famous No. 8 right here. On April 11, 1961, Carl Yastrzemski lined a single to left off Kansas City starter Ray Herbert at Fenway Park, and although he was caught stealing to end the inning, a great career was born. His final Opening Day was as DH against Toronto at home on April 5, 1983. That’s a 23-year span and 18 All-Star selections. We remember Joe Morgan, already a two-time All-Star by the time he got to Cincinnati and began wearing No. 8 in 1972. In his first game for the Reds in their traditional opener, a 3-1 loss to the Dodgers, Morgan started at second and went 0-for-3 with a walk, batting behind Pete Rose. A month into the season, Morgan would ignite the Reds with a decisive homer and double in a 5-4 win at home against St. Louis, the start of a nine-game winning streak. The Big Red Machine was effectively functional, with a World Series appearance that fall and then repeat titles in 1975-76 (when he was back-to-back NL MVP). For five straight seasons, 1972-76, Morgan led Sparky Anderson’s club in WAR. On April 6, 1979, Willie Stargell went 2-for-4 in a 3-2 loss at home to Montreal. That was nevertheless the start of something big for the Pirates, who proceeded to win their most recent World Series title. And for Pops, it was the start of a banner year in which he was named National League Most Valuable Player, as well as World Series MVP after his three-homer Fall Classic. For many, we’re saving the best for last here. Cal Ripken Jr. was called up in 1981 by Baltimore and was given the third base job in ’82 after the club traded Doug DeCinces. Ripken homered in his first at bat of that season, against Dennis Leonard of Kansas City. It was a three-hit day. Of course, the Iron Man would become not just a familiar presence on Opening Day, but also on every day. He passed Gehrig’s “unbreakable” record of 2,130 consecutive games played and wound up with 2,632 straight. I was there that night in Baltimore for 2,131, and it is still unthinkable nearly 19 years later that such a run could happen. But it did. Who should be No. 7? Brian, thank you, thank you. Just when you think you are organized, you hit the Publish button without that extra paragraph! Updated with Yaz…of course. Thanks.